I played Paranoia (2nd Ed.) for the first time today. What a great game! It’s definitely oriented towards one-shots and not campaign play, so it makes an ideal ice-breaker for a new group or a make-up game if your regular one can’t be played. A recommended experience for any gamer. Treat your encounter locations like NPCs and you just might get more interesting and entertaining results at the game table. In Issue #219 I made a call-out for roleplaying encounter location ideas. That wonderful list follows as the last tip below. The physical location is just one part of the formula to great roleplaying encounter settings, though. Encounters are like NPCs. And a good roleplaying NPC has multiple dimensions. In addition to designing his statistics, he would benefit from having a personality, a motive or goal, a secret, and a quirk or two, among other things. Treating encounter locations the same way, as a multi-dimensional game element, should give them more personality and life and please your players more. The tips below assume you’ll be using the location for a roleplaying type encounter. The tips could easily apply to other types of encounters, such as combat and puzzle, though for those types I’d do things a bit differently. Maybe that would make a good future article? You’re either in design mode before the game or winging-it mode during the game and you’ve picked your spot for an encounter. It might be on a pier, in an empty church, or in the furnace room of a hospital. What now?It’s important to try and make every encounter location distinct and interesting. The players will be more attentive to the game and their PCs’ surroundings. You’ll be helping them envision the setting and get into character better. While detailing a location’s contents and inhabitants well is important (see tips below), they don’t always help make a setting unique. What happens if the PCs visit the same place multiple times? The same old objects and NPCs will probably be there and each encounter in that place will seem less distinct and unique. The solution is to add some attitude. Before the encounter begins, decide on a mood, disposition, or bias for the setting, and make it different each time an encounter takes place in the same location. This way, even if the location is the same, it will have a different feel to it and the players’ perceptions of it will change. Once you’ve picked an attitude, slant the encounter’s various elements to suit the mood. This is where your creativity and joy of design comes into play. It’s a puzzle. For example, how could you make your next encounter location sad? It’s important that the NPCs in your roleplaying encounter react to the attitude you’ve created. This acknowledges the difference and draws the players’ attention to the attitude. It will also queue the players to roleplay and react to the attitude as well, which is one of the main points of the exercise. Adding attitude not only makes encounter locations different and interesting, but makes encounter types different and interesting as well. Imagine a hostage negotiation in the scenarios above. Each roleplaying encounter would feel, and possibly play, differently because of the changed mood of the location. In many cases, you’re dealing with a change of perception and a bit of poetic license. Today, the cracks in the walls seem discoloured and ugly; yesterday, they looked like they formed a happy face. As long as you don’t mislead the PCs, they’ll appreciate the special touches that adding attitude brings. Add a mysterious or unknown element to each encounter location. The secret doesn’t need to come into play or even be directly observed by the PCs. It just needs to be there as subtext and used as an interesting encounter element that subtly flavours your roleplaying.As with NPCs and plot secrets, location secrets can help you in other ways, such as by spawning side-plots, acting as hooks, or adding a wow factor to a future session when the secret is revealed to the players. Look for opportunities to make the location you’ve picked synergize with what’s happening in the encounter. For example, if the PCs are investigating some stolen jewelry and they’re interrogating a petty thief in an alley, you might take up the theme of “theft” and flavour the setting with it. A young hooligan might steal an apple across the street and a cheeky flight from the merchant ensues. Perhaps a dark cloud passes overhead, stealing the light and darkening the shadows of the alley. Perhaps some kids are playing piggy-in-the-middle in the street.If you know what kind of roleplaying will take place and you still have the opportunity to pick the location, choose a setting that matches the anticipated mood or nature of the encounter. As the PCs try to verbally outmanoeuvre their foe, the NPC draws out various scrolls and books from the shelves to accentuate his points. In fact, there is often little relationship between the potential of an event happening, such as the crime you are accusing me of, and the actual occurrence of said event! This tip works well in conjunction with giving locations attitude. You can set-up a double-whammy of location type and attitude adjustment to lend the place great mood, symbolic props, and poignant atmosphere. If nature abhors a vacuum, so do encounters. Flesh out a location by filling it up with objects. The added details that objects provide help bring encounters to life. The objects themselves also make great props to help you and your players roleplay.Adding stuff is where many GMs get stuck, especially if they’re winging it. It can also be a time-consuming design task. This seems like a no-brainer, but it’s often poorly done, and therefore yields poor results. What happens is that we get stuck in left-brain, analytical mode. You are presented with a location and you logically try to brainstorm a list of possible contents.Instead, if you graphically try to imagine what the area or place looks like, all sorts of details can come to mind that a brainstorm list might not get. Start with picturing the structure or boundaries of the area. Then fill in the lighting. Then entrances and exits. The think of what the purpose of the area is and what kinds of things would be around that would serve this purpose. Picture furniture, tools, machinery, decoration, and storage.One of the big benefits of envisioning a location instead of just listing its contents is that you can usually instantly summon the picture during a session and describe it to the players with greater speed and ease than finding and reciting off of a list.This is also an activity you can perform while driving, standing in line, etc. During a session, while winging-it, it often just takes a few moments to conjure up an image before you start the encounter. Use magazines, books, or the internet to find a visual of your location. Then note the scene’s contents and make a an inventory from there. If the genre and details are close, you can simply use the picture during the session. Just be prepared to answer all the “what’s this?” questions you’ll get! Players usually have less going on than you will and can spare a few brain cycles to ponder what contents the location would have. Once the player in done her description, you add in any other important items as required.It’s often effective to give the player a couple minutes’ advance notice so they can properly ponder what the location holds. Once you’ve filled the area up with stuff, be sure to interact with it. Don’t have the NPCs stay rooted to their starting positions as they parley with the PCs. Have them pour themselves a drink, peer out a window, summon the shoe shine boy, or pick up the fire poker and wave it around. This will encourage the players to do the same and will bring the location to life. Feel free to have the props act upon the NPCs and PCs too! Have something fall (not dangerously though), something operate, something move or make a noise. Have something break, spill, or work exceptionally well. We know it’s going to be a roleplaying encounter, so there’s going to be at least one NPC, be it a person, intelligent magic item, smart beast, or what have you. However, when possible, add more NPCs to your locations. Encounters hate being lonely!The purpose is to flesh out the encounter with things to interact with or talk about. If your genre allows it, think of some unusual NPCs to spice things up–just beware of their distraction potential though. Adding NPCs also creates more witnesses. You can use this as a defensive or offensive GMing tactic. For example, it would be harder to for the barbarian commit a spontaneous attack/murder in a stadium full of sports fans than it would if the encounter took place beneath a bridge. To be on the offensive, and to create greater challenge, prying eyes and straining ears can make some types of roleplaying encounters more interesting for the PCs. Witnesses, and “filler” NPCs in general, are a great GM tool, so use them generously. Don’t forget to think in three dimensions when considering the encounter location. Think left, right, up, and down. Believe it or not, your roleplaying encounters could suffer from the same toe-to-toe syndrome that your combat encounters might!Instead of the PCs and NPC(s) always standing or sitting close together and chatting, separate them and place them in all three dimensions. Put the NPC up on a ladder as he’s painting a room or looking for a book. Place the non-player character in the tiny cellar or up in the loft. Have the PCs straining their necks as they stand speaking with the mounted guard.In your next encounter, try to add stairs, ladders, elevators, a dais, a pit, a cellar, a platform, and so on. Have the NPC(s) move around during the encounter so that they move through the location’s varied space to further drive home the impression of dimension.Add in some range and suddenly you have many more options and opportunities for bringing roleplaying encounters to life. Think waaaay up, and deeeep down. Think what’s a few dozen yards to the north, east, west, and south. What’s happening in the area around the ground zero point of the encounter? What events are occurring nearby? Have NPCs “go for a walk” so that the encounter takes place on the move, further adding dimension to the location. What sounds and sights from nearby might impinge upon the encounter location? Try to avoid adding too many distractions to a location, but it wouldn’t hurt for every third encounter or so to have motion or be impacted by something else nearby in mid- roleplay. Following is a nice, long list of location ideas for your upcoming roleplaying encounters. These should act as kernels to which you add attitude, secrets, objects, NPCs, and dimension. Thanks to everyone again for their submissions! * GREAT On-line GM Tools * 75% off all Figs! When most GMs create NPCs they assign them certain characteristics, such as extrovert/introvert, etc. We all know these. I’ve had many times where I’m staring at this and am scratching my head thinking…ok, what now? 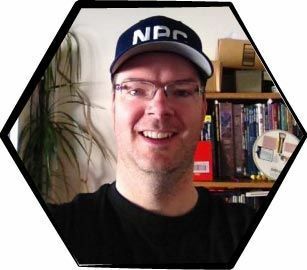 I figured if I could get deeper into what that NPC has been going through in his personal life, it might reflect in the way he interacts with the PCs. I’ve tried to keep it simple, but you can see how easily you can add modifiers, or other areas of influence. By rolling a die (10, 20, or 00, personal preference) you can see if they’re having a good or bad day in that part of their life (or week, month, year). High rolls mean the NPC is doing well in that area, low not so good. It’s hopefully straightforward and you can see where it may even lead to some fun side-quests. Hey, the innkeeper got some money (+Money) in from his new marriage (+Love), but is sick (-Health) and is willing to pay the PCs to travel to the next town and bring it back. A lot of NPCs are in bad health. Is there a plague in the works? A lot of good fortune: organized crime paying people to be quiet. A lot of bad fortune: extorting protection money. It’s a great and powerful program, and although the original program and website is German, most of it has been translated to English. l Personally, I don’t set up encounters with the characters in mind–unless the foe has the characters in mind. I simply construct the situation and let the characters bring what they have to bear against it. I used to get the complaint (always from the same people) “there is nothing for my character to do.” Eventually, I had the epiphany that this was code for, “I’m not constantly the center of attention.” I sat my group down and explained that it was not my responsibility to play their characters. They were responsible for applying their skills and ideas to the circumstances of my creation. That has been my functional doctrine since. Create the scenario and let the players decide how to apply the characters’ abilities to solve it. The only thing I avoid is the one-solution problem unless the tools are right in front of the party. i.e. The one key will be around the bad guy’s neck. It is up to them to get the tools, but the tools are presented and obtainable. These are great. I will definitely be using this for my games. Insect, small flying (i.e. bumble bee) - 12 m.
Insect, small walking (i.e. beetle) - 0.9 m.
Insect, large flying (i.e. locust, giant bee) - 36 m.
Insect, large walking - 1 m.
Dog, small - 12 m.
Dog, large - 12 m.
Human, small (i.e. gnome, dwarf, goblin) - 6 m.
Tyrannosaurus Rex - 12 m.
Bird, small (raven) - 12 m.
Bird, medium (hawk) - 18m. Bird, large (osprey) - 18m. Bird, humongous (roc) - 24 m.
Cart or wagon - 6 m.